Translator’s Note: This is an English translation of the original Chinese language text article entitled ‘毛泽东与佛教的缘分：一生参拜过的寺院’ which implies that the founder of the Chinese Communist state, and leader of the Chinese Communist Party – Mao Zedong – had a lifelong association with the Buddhist establishment of China. At first reading, the content of this information may seem surprising to those who are usually more conversant with the racially motivated anti-Chinese propaganda that routinely permeates Western media, political parties, and educational establishments. In this regard, the information below reveals what may be considered a historical corrective to the incessant misrepresentation of Chinese history and culture in general, and the details, motivations, and realities, surrounding the life of Mao Zedong in particular. Although undoubtedly a Marxist-Leninist, Mao understood the relevance of Buddhist philosophy and the value of the Buddhist presence in his country. Although opposed to the imaginations associated with theistic religions, Mao did not personally associate this policy with the Buddhist religion as he experienced it. Indeed, at one point in this historical narrative, Mao is even seen discussing the relevance of the ancient divination manual known as the Classic of Change, with an old Buddhist monk. The Buddhist temple is a place where Buddhist monastics lead a disciplined life, and those who hold a profound belief, worship the Buddha. The temple is also a place that attracts many tourists and travellers. Since the days of Buddhism being introduced into China, the temple has served the purpose of instructing all living beings without exception. Due to its special environment and position, it has played a particularly important role in the political arena of China. Mao Zedong (毛泽东) is the founder of ‘New China’ (新中国 – Xin Zhong Guo), and since the day of his birth an unbreakable bond with Buddhism was forged. Regardless of where his studies took him in the outside world, or when he was busy successfully leading the revolutionary forces to victory, he never abandoned his connection to Buddhism, or to the Buddhist temple. New China was founded over 60 years ago, but on the night before the founding; Mao Zedong took refuge in a Buddhist temple whilst the fighting continued outside. Here, he carried on important work, refining the preparations for the final victory and assumption of power. Today, pen has been put to paper about this important issue of Mao’s association with the Buddhist temple, and the following 10 examples have been compiled from Mao’s autobiography as a 60th anniversary gift to the nation of China. 1) Stone Goddess of Mercy Temple (石观音庙 - Shi Guan Yin Miao). This is the first temple associated with Mao Zedong’s early life. This temple lies in Xiangxiang County, which is situated in Hunan province – where the clan surnamed ‘Tang’ (唐) has its village named ‘Tang Jia Tuo’ (唐家坨). This is the clan from which Mao Zedong’s maternal grandmother (and mother) originated. Both Mao’s mother and grandmother were sincere followers of the Buddha, and prior to the birth of Mao, his mother – Wen Qi Mei (文七妹) – had already given birth to two children who had not survived. On the 19th day of the 11th lunar month, of the 19th year, of the reign of the Guangxu (光绪) Qing Dynasty emperor (which corresponds to the Western date of the 26th of December, 1893), she gave birth to her third child, named Mao Zedong. As she was afraid that he might not live, she took him to her ancestral (Tang) village in Xiangxiang County, where he could be cared for. In this village there is a deep pond named ‘Dragon Pond Opening’ (龙潭口 – Long Tan Kou). This pond is situated near a very large boulder, which measures around 27 feet in height, and around 20 feet in width. On the top of this boulder was built a small temple. This is the Stone Goddess of Mercy Temple. Mao Zedong was born shortly after his grandmother and mother visited this temple and lit incense and bowed down to the image of the Buddha, stating that they recognised the boulder (that served as the foundation of the temple), as Mao’s step-mother. As Mao was the third child to be born, he received the name ‘Stone Third Born Child’ (石三伢子 – Shi San Ya Zi). Mao was taken to worship in this temple when less than a year old. 2) Southern Mountain Great Temple (南岳大庙 - Nan Yue Da Miao). This is the temple where Mao first visited on foot to make an offering to the Buddha on his mother’s behalf. This temple is located at the foot of Mount Heng (衡山 – Heng Shan), an area also known as Nanyue (南岳), and is situated to the north of the old town of Nanyue (南岳古镇 – Nan Yue Gu Zhan). It was built during the 13th year of the Kaiyuan (开元) imperial period of the Tang Dynasty – which corresponds to the year 725 CE. The design of its main hall is based on the architectural style of the imperial palace in Beijing, and its grounds cover 98,900 square meters. Its main hall is over 70 feet high, and it is the biggest and most complete temple to be found on the five sacred mountains of China. This temple is 132 Chinese miles (里 – Li) from Mao’s home village of Shaoshan, and is locally known as the ‘small imperial palace’. In 1908, (some say 1909), Mao’s mother – Wen Qi Mei – fell ill for a long time and could not be cured. She made a wish to go to Nanyue and worship the Buddha there. However, as she was very weak, she could not make the trip. At the age of only 15 years old, Mao made the trip to Nanyue and made the offering on behalf of his mother. To save money on the journey, Mao took dry food from his home, and drank mountain spring water along the way. When he was hungry, he ate dry bread from the bag he carried. Mao walked for two days and one night to reach the Southern Mountain Great Temple, and then devotedly worshipped on behalf of his mother – for her well-being. After completing the ritual, Mao visited the ‘Gate of Granting Excellence’ (嘉应门 – Jia Ying Men), the ‘Imperial Stone Tablet Pavilion’ (御碑亭 – Yu Bei Ting), the ‘Tomb Pavilion’ (寝宫 – Qin Gong), and then climbed the Zhurong (祝融) peak of Mount Heng. This was not only Mao Zedong’s first time away from home, but also the first time he worshipped alone at a Buddhist temple. 3) Secret Seal Temple (密印寺 – Mi Yin Si) at Mount Wei (沩山 – Wei Shan). This is where Mao Zedong first discussed with ordained monastics, the correct meaning of the Buddhist sutras, and the correct method of Buddhist practice. The Secret Seal Temple of Mount Wei is near the hometown of Premier (主席 - Zhu Xi) Liu Shao Qi (刘少奇) – which is in Changsha City, Ningxiang County – where Taojiang, Anhua, and Ningxiang counties intersect – within Hunan province. This temple is more than 35 (Chinese) miles from Shaoshan, and was founded in the year 708 CE. This temple is the birth place of the Wei Yang Lineage (沩仰宗 – Wei Yang Zong) of Ch’an Buddhism, and this ancient temple has a continuous history of over 1,200 years of practice. In the middle of 1977, Mao was on his summer-holiday from attending as a student at Hunan’s First Normal School, when he asked his friend - Xiao Zi Zheng (萧子升) - to accompany him on an educational hiking tour, starting from Changsha. Xiao Zi Zheng was a top scholar at the Hunan First Normal School and graduated a year before Mao. They each brought an umbrella, and a bag which contained a basic change of clothes. The journey lasted many months and covered over 900 (Chinese) miles. They travelled throughout the five counties of Changsha, Ningxiang, Anhua, Yiyang, and Yuanjiang. It was during this tour that Mao made a special visit to the birthplace of the Wei Yang Lineage of Ch’an Buddhism at the Secret Seal Temple. He met the old abbot of the temple and together they read through various Buddhist sutras, and discussed the profound meaning contained therein. In this year Mao was 24 years old, and this was the first time that he discussed the spiritual path of Buddhism with monks. Over-all, Mao spent nearly 5 months at this temple whilst campaigning against the corruption of Zhang Jing Yao. It was at this temple that Mao carried-out his first revolutionary work. 6) Silver Field Temple (银田寺 - Yin Tian Si) – in Xiangtan (湘潭), Hunan province. This is where Mao Zedong (together with key activists), first held a secret meeting of the Peasant Movement (农运 – Nong Yun). This is an ancient temple situated in Silver Field Town (银田镇 - Yin Tian Zhen), which is in the Mount Shao (韶山 – Shao Shan) area of Xiangtan, Hunan province. This temple is 8km from Mao’s former home, and served as the centre-point for the protection and preservation of Buddhist temples and monasteries within Hunan province. This temple was built in the Ming Dynasty, during the 3rd year of the reign of the emperor known as Tianshun (天顺) – which corresponds to the year 1459. It was formerly known as ‘Tranquil Peace Temple’ (静安寺 - Jing An Si) and during the reign of the Qing Dynasty emperor known as Daoguang (道光) [1820-1850], the temple was repaired and expanded. As a pot containing silver was dug-up within the grounds at this time, the temple was renamed ‘Silver Field’. The temple faces south, and is comprised of a brick and wood structure. Its outer wall is painted white. It is very different to other temples in the south, as it is the only one to have ‘white’ walls. This is why it is also known as the ‘White Temple’ (白庙 – Bai Miao). On the 12th day of June, 1923, the ‘Third Congress of the Chinese Communist Party’ (中共三大 – Zhong Gong San Da) was convened in Guangzhou. Mao attended this third congress, and then went back to Hunan to begin the organisation of the Peasant Movement. The Silver Field Temple was chosen as a headquarters because it was secure and safe. In October, 1925, the Xiangtan District First Peasant Association was founded at the Silver Field Temple. At the same time, a room in the temple was used to print peasant association documents entitled ‘Knowledge and Action Cooperatives’ (知行合作社 – Zhi Xing He Zuo She), which promoted the ideas associated with the movement. He then gestured with his hands in front of his own belly to illustrate his point. Mao Zedong eventually recovered his health whilst staying in this temple, and left to fight the encirclement. 8) Lonely Flower Lama Temple (索花喇嘛庙 – Suo Hua La Ma Miao), situated in the Songpan County area of Sichuan province. During the period of the Long March (长征 – Chang Zheng), the Red Army (and Mao) arrived in this area during August, 1935 – where a meeting of the politburo took place. Mao Zedong learned of the lamasery in the area, and on the 20th of August, used the temple to hold the ‘Mao Construction Conference’. At this meeting Mao drafted the document entitled ‘Supplement Decision about the Present Strategic concept’, which criticised the policy of Zhang Guo Tou (張國燾), which suggested that the Red Army should retreat into the border areas of the Gansu region. Mao declared this negative policy as a rightest deviation and suggested instead that the Red Army should devise a strategy of helping the populations and develop the areas of Shaanxi and Gansu. The lamasery now has a memorial hall dedicated to the ‘Mao Construction Conference’ – and is seen as the place where the revolutionary bases for the Sichuan, Shaanxi, and Gansu areas were formed. The Incense Burner Temple is located in north-eastern Jia County, situated on a 200m cliff by the bank of the Yellow River. Three of its sides face empty space and a sheer drop. The frontal area measures around 5m wide, and around 2m in front of this area, stands a large boulder that is 20m high. This structure appears to be shaped like a cauldron for burning incense – with legs, handles and a rounded body, etc. This resemblance to an incense burner is how the temple got its name. This area was formerly known as the ancient ‘State of Jia’ (佳州 – Jia Zhou), and is renowned as one of the eight outstanding areas for visual beauty. Whilst Mao Zedong was fighting in the northern Shaanxi area, he only had time to visit this monastery. Mao and his delegation stayed two days upon Mount Wutai, before leaving on the third day and travelling back to Xibaipo, where they arrived on the 1st of May. From Xibaipo, Mao Zedong travelled to Beijing where he consolidated power and eventually announced the founding of the People’s Republic of China. 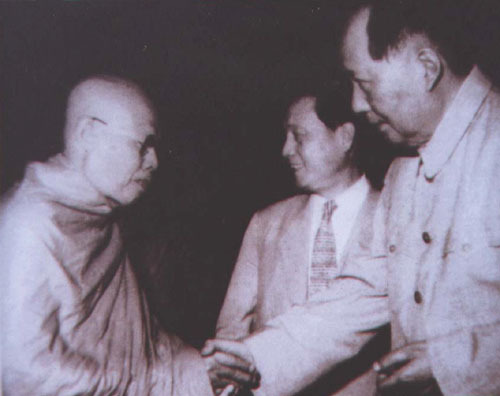 During the revolutionary process of the establishment of the new China, Chairman Mao Zedong shared a profound connection with Buddhist temples at every stage, forging a profound relationship. In fact, it can be correctly stated that the historical revolutionary process was assisted from start to finish by the Chinese Buddhist establishment. This serves to demonstrate the force of attraction associated with Buddhism – particularly with regard to the practice of ‘Buddha-Dharma in the World, whilst not leaving the world to seek enlightenment’. It has been over 60 years since the establishment of the People’s Republic of China, and the many glorious achievements from that day to this must never be forgotten. Our efforts should be redoubled with regard to the cherishing and protecting of Buddhist temples, as they represent a very important part of the cultural wealth of the Chinese nation. Their presence brings harmony to China.